Smithton (pop ~3500) is the largest and oldest established town on Tasmania's far north-west coast, known as the Circular Head region. Smithton is in the forefront of the area's dairy farming and vegetable growing activities, and processing of these products is an important part of the local economy. Other industries on which Smithton is based include forestry and fishing. 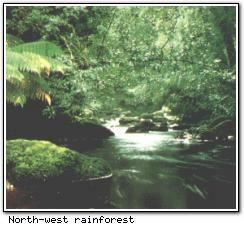 Smithton is also known for its blackwood forests to the north-east, and forestry reserves to the north and west. There are many recreational opportunities on offer, including bushwalking and a playground area at Wombat Tarn, or (for the extremely adventurous) travel west to Marrawah and surf the Indian Ocean. There are also fishing and boating opportunities in the area. The Lacrum Dairy Farm (open for public viewing summer & autumn afternoons) has regular milking demonstrations, cheese tastings and sales. Also in the area are the Allendale Gardens (a privately owned botanical gardens with rainforest walk), and Gunns timber mills, the largest hardwood mill in Australia. Smithton is an excellent gateway to the west coast's Arthur River area, with stunning wilderness only a short drive away. Smithton is about one hours drive from Wynyard. If going along the Bass Highway, watch for the long jetty sticking out into Bass Strait at Port Latta, where ore is transported to waiting bulk ore carriers. Smithon has three 4-star and one 3½-star accommodation facilities (RACT rated).